Successfully Added 1 DIN Car Audio Entertainment System (MP4/DVD/VCD/MP3/CD, 50W x 4) to your Shopping Cart. 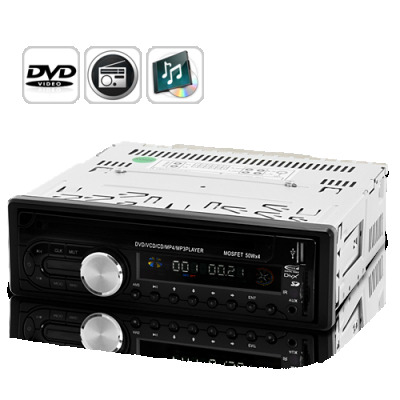 With this 1 DIN Car Audio Entertainment System, not only will you be getting great music from FM Radio and CD's, but with the AV OUT, connecting the 1 DIN Player to any size LCD Screen for playing DVD's is both easy and less expensive than buying a Car DVD Player with a screen pre-installed. Also featured is a USB port and a SD card reader for playing all of your digital movies and music with the super sound available though this Car Audio System. This Car Audio System comes with a sleek stylish design and can be easily installed in any car with a standard one DIN slot. Plus, it has a remote control for easy operation of the product. In a nutshell, this is an affordable alternative for expensive Car DVDs to offer you equal amount of in-car entertainment. Now offered at an unbeatable wholesale price from the leader in direct-from-factory electronis, Chinavasion, suitable for both single dropship orders or bulk quantity purchase. Get yours today!